Lionel Messi has now moved seven goals clear of rival Cristiano Ronaldo in the race for this season’s European Golden Shoe. Messi and Ronaldo have both won the European Golden Shoe award multiple times. The Barcelona star has won it five times, while the Portuguese has emerged the winner on three different occasions. Both players are once again in contention for the award, having made brilliant starts to the season. While Ronaldo has moved to Juventus, the 34-year-old is still as sharp as ever, as he continues to score goals for fun. Messi, on the other hand, has not slowed down either and is still dominating LaLiga in terms of goals and assists. Over the weekend, the Argentine was once again on target as Barcelona beat Rayo Vallecano 3-1 on Saturday. Messi’s goal against Rayo Vallecano took his league tally to 26 goals. It means he has now pulled seven goals clear of rival Ronaldo. The Portuguese didn’t feature over the weekend as Juventus defeated Udinese in Serie A. The 34-year-old was rested ahead of Juve’s Champions League clash against Atletico Madrid in midweek, however, it has affected his ranking in the European Golden Shoe race. Not only has the gap to Messi widened, but the Portuguese has also been overtaken by Fabio Quagliarella as Serie A top-scorer. The Sampdoria striker scored over the weekend to take his goal tally to 20 – one ahead of Ronaldo in the Serie A top-scorer race. Meanwhile, Kylian Mbappe is closely behind Messi in the European Golden Shoe race. The PSG star didn’t feature over the weekend but still has 24 league goals to his name. Mbappe is currently just two goals behind Messi. 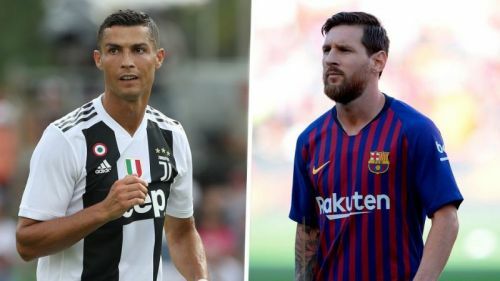 Both Messi and Ronaldo will be in Champions League action midweek, as Barcelona and Juventus take on Lyon and Atletico Madrid, respectively.